But nothing can compare to the pain and anguish that DeMarcus Cousins must be going through right now. After leading for pretty much the entire game, the New Orleans Pelicans were on the precipice of losing to the Houston Rockets. However with just over 2 minutes left in the game Luc Mbah a Moute picked up his dribble and was stuck. He was stuck because DeMarcus Cousins pressured him, hounded him and stole the ball right from his back pocket. Boogie straight mugged him. He wanted it. From there the Pelicans would continue to hold their own against one of the best teams in the NBA. Houston kept coming back, kept trying to take the game from the Pelicans. But they didn’t give up. Not giving up was Cousins. With 22 seconds left, New Orleans clung to a 2 point lead. They were panicked as Holiday tried to create something and kicked it to E’Twaun Moore who jacked up a shot to beat the shot clock. It hit the rim and the Rockets had a chance to tie or take the lead. But they didn’t. DeMarcus wasn’t giving up, he muscled his way to the ball, grabbed it and went straight back up to lay it through the hoop for two points and an added foul. New Orleans did it, they seemingly had won the game. Cousins went to the line to add the lagniappe but as he shot he knew he missed. So he did what he had done all game and hustled after the ball. He did so to his own demise. He tore his Achilles and his season was over. There’s no real way to understand or convey how truly devastating last night’s win was for the Pelicans. They showed on national television, to the entire country that they belonged. Davis, Cousins and Holiday showed that they can co-exist together. It CAN work. They showed that there are contributors in E’Twaun Moore and Darius Miller. They took it to one of the best teams in the league and while they faltered somewhat, they didn’t give in. They weathered the storm. New Orleans has won 8 of their last 10. They have wins against Boston, the Blazers and now the Rockets across that time span. Anthony Davis said it best post-game, “We we’re just figuring everything out. That’s the tough part.” New Orleans were beginning to show that they were a team to be reckoned with. And that is why everyone is all so sad. What should be a moment for optimism and excitement has now made way for despair and dread for what lies ahead. Not just for this season but also beyond. Cousins was on the final year of his deal and was entering the off-season looking for a long-term, maximum deal. This guy deserves to get paid, but now after suffering an injury that ends careers the path ahead seems a lot more uncertain. He was averaging 25 points, 12.9 rebounds, 5.4 assists, 1.6 steals, 1.6 blocks… it was ridiculous. He was 6th in the league in RPM (real-plus minus) and was second in RPM wins to only Jimmy Butler. But, this is where we are now. The past 48 games has been filled with many ups and many downs. Cousins and many of his team-mates have been having career seasons. DeMarcus and Anthony were about to do something that hasn’t been done in a long time, two team-mates averaging 25/10 over an entire season. Teams hated to play them both. One night DeMarcus would put up 40 points and 20 rebounds and Davis would somehow quietly “chip in” 30 points and 10 rebounds of his own. These two were beginning to figure it out. They were about to turn the Smoothie King Center into a party house between now and April. But alas, the cruel mistress that is fate butted in and decided that this was a party that was not meant to be. 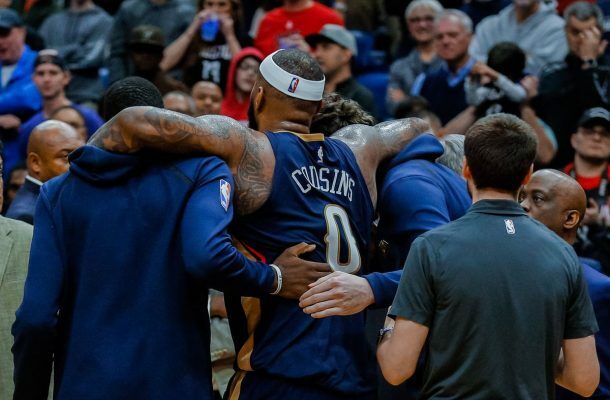 I cannot convey enough how devastated I am for DeMarcus and the entire Pelicans organisation. I wish him a healthy and speedy recovery. Here’s to one hell of a season.